An experiential, conceptual and minimal design piece which tunes into the ultra light and extreme comfort of the Play headphones. Surrounding physical craftsmanship in an ambient environment, emphasising elegance, tone, balance and atmosphere. 1984 London is the design studio of creative and design director Chris Jarrett. We specialise in transforming ideas into reality with unforgettable experiences. We accept Visa, Mastercard, American Express and Paypal. If you are buying from outside of the UK, a live exchange rate will be applied. When you have placed an order you will receive a notification email confirming we have received your order. Orders will be dispatched within 24 hours unless stated otherwise and we will send you a tracking number once the order has been sent. International delivery is free and first class. Please note that delivery times will vary from country to country. Your order may be accountable to local taxes and/or import duties which are appointed by the country being shipped to. 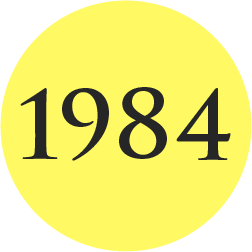 1984 London are not able to calculate, or provide the specific amount of duties and taxes your order may incur, as these vary from country to country. We hope you love the limited edition Famous Monster. If you would like to return or exchange your item, we need you to let us know within 14 days after your order is received. Please send an email to shop@1984london.com submitting your order number, reason for return, or exchange with the specified new size. Once this has been done, you have another 14 days to return the order to us. We will send you the return address once you have submitted your return email. We would recommend using a tracked delivery postage service. All T-shirts must be returned unworn, unsoiled, in their original undamaged packaging with tags attached. We cannot accept any returns that are not returned in their original state. Any T-shirts that are received back which are not in a resalable condition will be returned to you. 1984 London are not responsible for any parcels lost in transit. Refunds are processed within 5 business days of receipt and you will receive email confirmation of your refund. Refunds are only issued back to the original payment method If your order is faulty, you must contact us within 7 days of receipt. 1984 London is devoted to assuring your privacy. Any information that we collect will be used lawfully, in accordance with the Data Protection Act 1998. 1984 London are not responsible for any damage. If you have any questions please email hello@1984london.com – We will get back to you within 48 hours.